Every fall students all over the country will flock to their respective colleges, enroll in courses, pick up their syllabi, walk over the bookstore and freak out at the prices of the required textbooks. No kids, those aren’t typos. Your physics textbook really does run $350 and yes, you are paying more than when you started just four years ago. 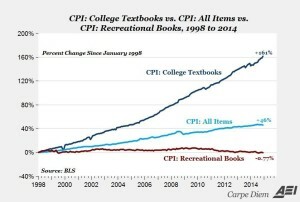 This week’s chart, brought to us by the American Enterprise Institute, shows the rapid rise in textbook costs relative to inflation and, super bonus, to books in general. Textbook costs have risen substantially faster than general inflation, home prices, and medical care. And this in a world where Amazon regularly slashes the prices of popular titles… traditional publishing books have actually decreased in price over the years. As the AEI full article points out, with average textbook prices for some disciplines in the range of $250 and with several books required each semester, this can add thousands and thousands of dollars to the cost of one’s college tally. Nobody will deny that students are getting ripped off, but what to do about it? How do we work these costs into our plans? Can these costs be combatted? We have given you some great tips, which you can find by clicking “books” in the categories column to your right.